I know some people aren't into New Years Resolutions, but I am not one of those people. I love this time of the year, because I get inspired by watching people set goals and make plans, and by making and setting my own. Last year, I only had one goal for 2013, which was to finish a draft of my book. It was a good goal, an important project, and I'll dedicate a whole post to that experience soon. As for 2014, I'm approaching the resolution thing a little differently. 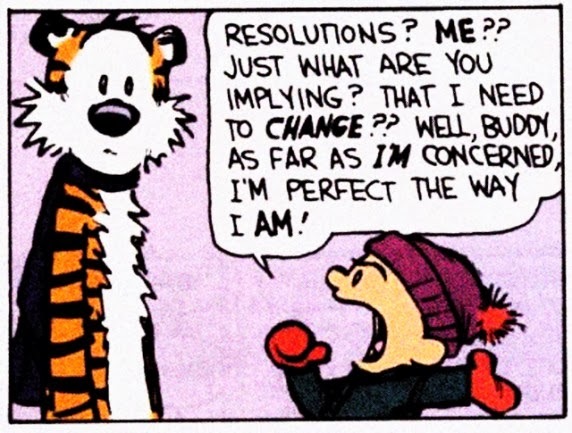 Most folks, I think, have the same sort of resolutions, and I'm no different. Exercises regularly, eat healthfully, call my mom more often. Get my finances under control, keep my house organized, volunteer. Make my passion a priority, and continue writing, revising, and submitting. Be a more patient partner, a more thoughtful friend, and a hero to my dogs. While I would certainly like to accomplish all that and more, those goals are par for the course. I'll always be striving for them, so why pin them onto 2014 specifically? I'd like to start the new year hydrated, which should tell you something about how I am ending 2013. I will attempt to drink two Nalgene bottles of water each day, which equals 64 fluid ounces, in addition to the usual coffee, tea, and booze. I'd also like to learn how to meditate. I'm going to start with five minutes a day, which right now seems positively insurmountable, and take it from there. Each day I will either mail a card or note to someone I love, or call a loved one on the phone. I'm attempting this in February, because it's the month of Valentine's Day and I like to spread the love, and also because it's the shortest month of the year and I really hate talking on the phone. I read all the time, but usually it's for school, or work, or for mindless distraction via the Internet. I deserve better - at least thirty minutes a day. I'm making this my March challenge because school will be hectic by then and reading is usually the first thing I give up when I'm feeling overwhelmed. Which is a shame, because it's when I'm feeling overwhelmed that I need reading the most. A minimum of 20 minutes, every single day. I've always wanted to do a yoga streak, and I like the idea of ushering in a new season, literally and metaphorically (classes are over at the end of April - sob) with a steady and centering practice. We're hoping to move this summer (just across town, but still), and that means getting rid of all the useless things we keep acquiring, despite not actually needing them. We'll plan and execute a yard sale in May, but I also want to find one thing each day to donate, sell, or give away. Goodbye clutter, hello freedom. I've attempted the 365 project in the past and failed miserably each time. Thirty photos in thirty days seems more do-able. Plus I'd like to improve my photography sans Instagram filter, and practice makes perfect. Which means my iPhone is off limits for this challenge - only photos taken with my real camera will count. So that's what the first half of 2014 is looking like for me. How about you?